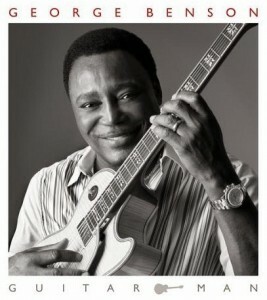 Diaa Bekheet | Washington, DC – Contemporary jazz guitarist and vocalist George Benson has released a new album titled Guitar Man. It’s a collection of great music showcasing his unparalleled guitar playing. Primarily arranged by musical director and pianist David Garfield, Guitar Man includes the funky “Tequila” featuring piano work by Joe Sample and percussion by Lenny Castro. The album has 11 other re-imagined smooth jazz and pop songs by great musicians, such as ”Naima“ by saxophone great John Coltrane, “I Want To Hold Your Hand” by the Beatles, “My Cherie Amour” by Stevie Wonder, Latin-tinged “Fingerlero” by Ronnie Foster and “Don’t Know Why” by Norah Jones. The accomplished Benson skyrocketed to fame, using vocal techniques. Considered one of the most successful jazz guitarists, he started his first group in New York in 1965, and achieved more success than any of his ‘comrades’ at the time. In 1967, Benson was invited by jazz legend Miles Davis to play with him before the jazz fusion explosion. They recorded the great hit album, Miles In The Sky. Since then, Benson has become one of America’s most successful and accomplished guitarists. He recorded the monster hit album Breezin’ in 1976, which has sold more than 10 million copies. Benson never limited himself to jazz music, but expanded to include pop and R&B throughout his 50-year career, during which he recorded more than 35 albums and won 10 Grammy Awards. Benson has developed a style that appeals to a broad mainstream audience. My colleague Russ Davis recently talked with Benson about his new album Guitar Man, two other new releases and his audience. Benson explained why he thinks a lot of people thought of him more as a vocalist than an instrumentalist. Guitar Man was recorded with the collaboration of a solid team of jazz icons, including Joe Sample, keyboardist and musical director David Garfield, bassist Ben Williams and drummer Harvey Mason. I profiled George Benson twice in the mid 1990s on my Jazz Club USA show. He told me then that he believes it’s the audience that gives a musician an identity and a stature in the world. Benson’s music follows my Arabic narration. You will also enjoy songs by Benny Goodman and Duke Ellington in the “Down Memory Lane” segment of the show. Brilliant improviser and vibrant entertainer George Benson says continuous practice is the key to mastering an instrument. Once in control, it’s easy to communicate with any other musician in any country, he advises. Benson has collaborated with many other acclaimed vocalists, including Pavarotti, Diana Krall and Erykah Badu. I thought you might like to know that I ran your story on George Benson on my little wire service. Proper credit was afforded VOA and yourself; I hope I credited you in an acceptable manner. Benson is one of my favorite jazz artists. I am also a great fan of Joyce Cooling. You might do something about her some time.